Are you looking forward to the Super Bowl this year? Well, the teams? Not so much. The food? Of course! I love to use the opportunity to gather a group of friends for an informal fondue party to supplement the usual football-watching fare. With our favorite teams unfortunately not playing in the big game, we put our rivalries aside and delve into a cheesy, melty feast. Marni and I have been doing this for years. 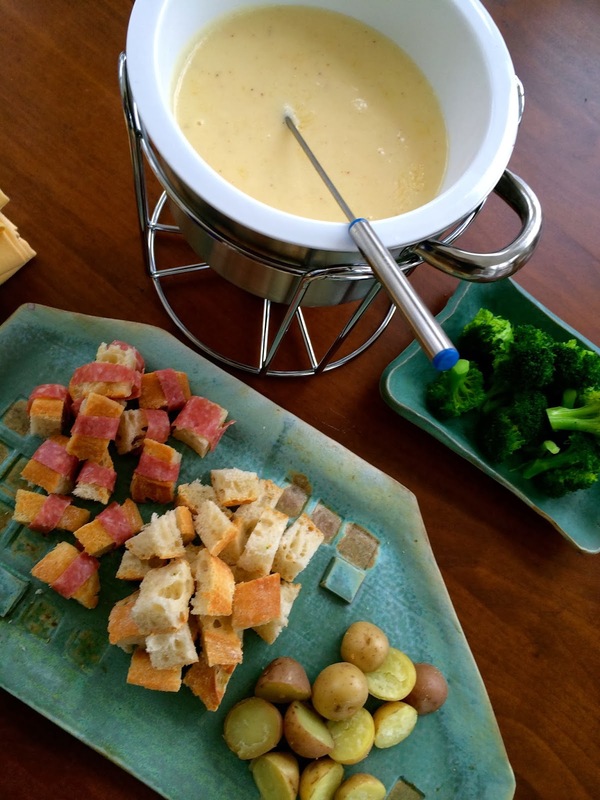 Whether it be a ski getaway or a random snowed in evening, we enjoy experimenting with fondue combinations. Sometimes we opt for classic cheese, hot oils steaming with meats and vegetables, a cascading chocolate caldron, or all three. It’s a fun, interactive way to dip and nosh with little cooking required. For the ultimate pool of gooey, drippy cheese, it's always key to keep in mind a couple tips. The best flavor is usually achieved by blending two types of cheeses. I love the blend of Jarlsberg and Fontina, but by all means incorporate a Swiss or Gruyere instead. Also, always rub the interior of your ceramic fondue pot with garlic. It adds a nice punch and pleasant aroma to the velvety, melty goodness. Have fun with accompaniments! On a whim, I wrapped baguettes with thin slices of salami before dipping into the rich cheesy liquid which offered a bite full of different flavors and textures. Over medium heat, add the wine and lemon juice to a small pot and bring to a gentle simmer. Gradually stir in the flour-coated cheese with a wooden spoon. Turn the heat to low and melt the cheese gradually, stirring constantly, until smooth. Do not let the cheese boil. Once smooth, stir in cherry brandy, nutmeg, salt and pepper. Pour into the fondue pot with a lit sterno candle underneath and serve immediately. Serves 4-6. Great alongside your favorite beer, glass of wine, Superbowl chicken wings, 7-layer dip...whatever!